You can learn a lot about a person just by gazing into their eyes. Often it is the most intimate and profound way of connecting with another. What we see, and what we prefer to see, can also contain hints about the inner working of our subconscious minds. Physiologically, the function of our eyes is to see the world. The subconscious filters what our eyes see, and also projects what we’ve learned and associated with certain things before it reaches our conscious mind. 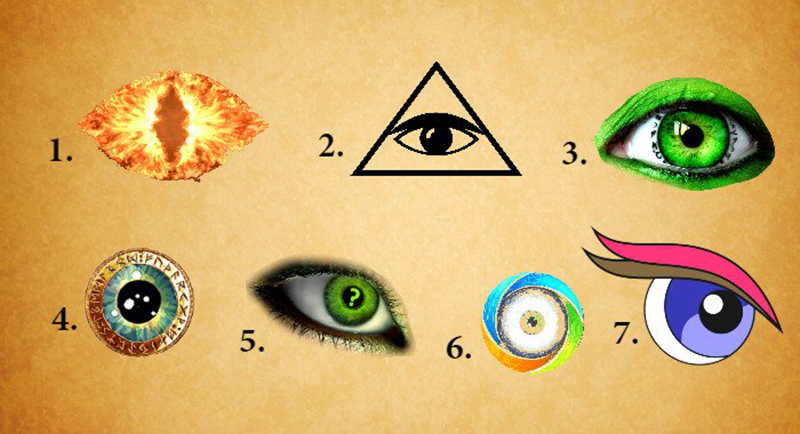 In this fun personality test, see which eye you are drawn to and what it could mean about your personality. Upon scrolling down to the image below, pick the eye that catches your attention instantly. It is the one which your subconscious first identified, just before your conscious awareness started to kick in. Your soul seeks spiritual nourishment! You feel the need for a connection to the universe that is beyond the physical realm and it urges you to try new things and go on thrilling journeys. You should learn the art of letting go and pursue this passion. The knowledge from your past lives is passed down to you, much like a spiritual encyclopedia. Go forth and spread this knowledge and you shall be recognized by those in your community and maybe even the world. The aura you possess is that of a healer and it is shining brightly! Embrace this aura and watch your vibration rise. Make good use of your healing powers. The world needs you! You have been gifted with a mind full of wonderful ideas! You may stray and get lost more often than not but trust your instincts and walk the path that you feel is righteous. Keep going! You know a lot more than other people but you keep it to yourself. You’re a mystery and this is what draws people towards you. Embrace who you are. You have walked the earth countless times before and so your view of the way things are is different from what others see. You doubt yourself and your purpose and are likely less self-confident. You just have to work diligently and eventually you shall find meaning behind all of this. You are a warrior of the night and darkness is your abode. Whether it is night or day, you prefer the company of shadows. You’re the type of person who only shows what others want to see and hear. Never change! Keep going down the path you chose.